As regulars at National Burger Day, Beer & Burger are clearly held in high regard. Unfortunately, due to the sheer number of options at NBD, I have always missed out on their delicacies. As such, when they opened their new venue near King Cross, complete with an impressively extensive range of beers, it was clear that the stars had aligned and it was time for me to heed the call. The simple menu is a stark contrast to the beer selection, and it shows how much they believe in their burgers. When you have quality like this, what else do you need? The bun is super soft, and is sweeter than your average brioche. Noticeably so, but it holds its structure, and cuts through any grease. This is further complimented by the red onions, which are crunchy and fresh. The patty is definitely greasy. But in a good way. 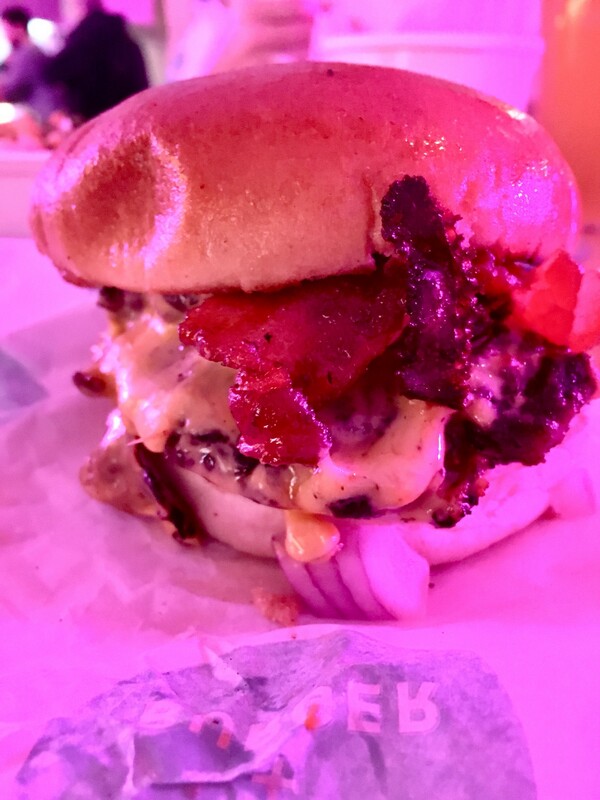 Much like Bleecker Street, the fat in the meat has melted through, enhancing the flavour throughout the whole burger. As for the cheese? These chaps have bloody nailed it! American, of course, but they have lathered it on, and let it melt to perfection. The result of this is a gorgeous coating of the mouth. It’s simple. It’s effective. It’s delicious. This burger is finished off with bacon and their secret sauce. The bacon is crispy without being too crunchy, and flavourful without being too salty. The two work in perfect harmony to bring out the bite even further. This is a delightfully simple and greasy burger, perhaps typified by the fact that the “Beer” comes first in the name, but that is harsh on the old boy. This burger is cooked to perfection, and delivered with aplomb. It is an earned regular at National Burger Day, and it would be a match for almost any burger out there.